Lamb, pork, pancetta, veal, rabbit, pheasant, tripe, brains--you can find it all at Biancardi's. Italians instinctively know that food and love go together like spaghetti and marinara sauce. I was lucky to learn that lesson early while growing up and feasting on delicious Italian food crafted lovingly by my grandmother Josephine. Nana spent many hours in her small, cozy kitchen preparing a variety of Italian specialties as only she could, but it was her ravioli and meatballs that we loved the most. The smell of simmering sauce would permeate the air tempting our taste buds as we approached the porch. Without fail, my dad would make a bee-line for the kitchen, grab a fork and stab a meatball from a simmering pot, inevitably dripping sauce on his shirt in an effort to escape her smack as she shooed him away. I think they both secretly enjoyed the ritual. Years have gone by and they are gone, but every time I bite into a good Italian meatball, or indulge in a decadent dish of ravioli, I'm reminded of how much I miss them both and wonder if either of them visited Arthur Avenue at some point in their lives. 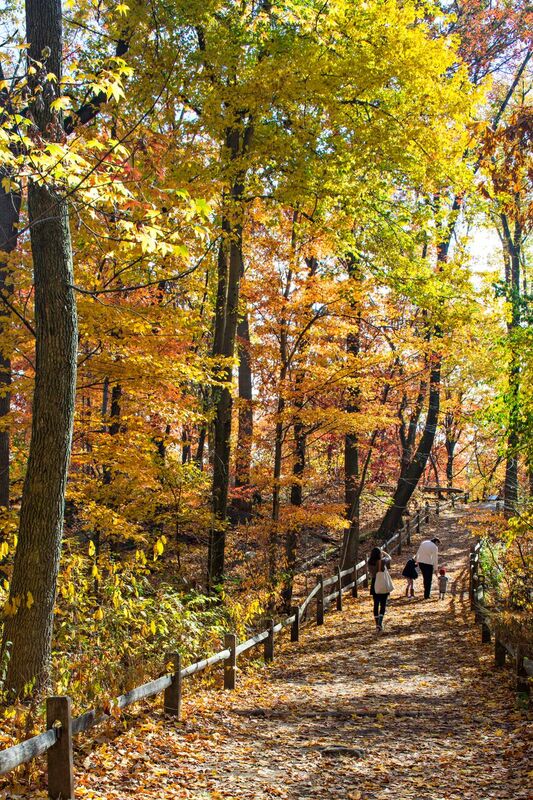 I recently learned of the foodie destination located in the Belmont section of the Bronx thanks to a local travel travel agency that offered a bus trip to the area. It piqued my curiosity, so I signed up and was soon exploring the neighborhood also known as "the real Little Italy." No matter where you live in these United States, you're likely noticing the demise of the "mom-and-pop" establishments. The fact that many continue to thrive in this small area is a testament to their grit and determination. 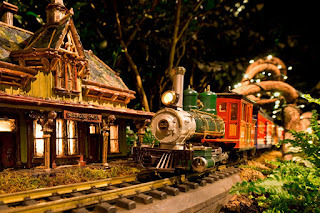 Many of the businesses are passed down from generation to generation. Maria Cappiello is just one of the individuals who shared her "Arthur Avenue" story with me. Her father was born in 1929 in a cold water flat above his parent's butcher shop on the famous street. "He and his brothers all became butchers and his sister married a man who worked in the store. That man went on to open a deli in the market that is still thriving today," said Capiello, whose mother arrived from Italy in 1951, moved to the neighborhood and frequented the shop. 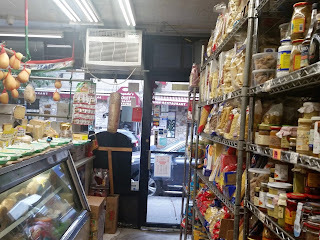 Cappiello said she spent many fun times on Arthur Avenue visiting both sides of her family in the 1970's and 80's and returns to this day with her children to visit and dine in the old neighborhood. Danielle Oteri, founder of food tour company "Feast on History," also has familial ties to the area. Her great-grandfather Albino Oteri opened a fish market on Arthur Avenue in 1916.Today she shares stories with tourists who come from miles around to stock up on provisions and take a leisurely stroll around town to indulge in bits and bites of this and that. "We have many amazing mom-and-pop shops and our goal is to keep people coming back," said Oteri. And it appears they do. Many individuals who rode the bus with me knew the routine and brought coolers along to stow their purchases for the ride home. Oteri takes guests to 12 iconic establishments where they can taste products and learn more about the history of the businesses, many which have survived for years, like Tino's, known for its pizza (shown below), subs, dried pasta and an impressive selection of olive oil and vinegar. A popular stop along the way is Calabria's pork shop known for its "sausage chandeliers." A few of the stand-out products include soppresatta, capicollo and a paprika-coated Italian bacon named pancetta Calebrese, "It's a butcher shop devoted solely to pork, which used to be more common years ago," said Oteri, adding that they butcher and cure all their own meat onsite, rather than in a warehouse. "The quality is magical," she said. Cheese lovers will find a little slice of heaven at Calandra's, which has been in operation since the 1930's. "At one time Calandra's used to sell ricotta only," said Oteri. Today Calandra's offers an array of cheeses, pasta, sausage and more. 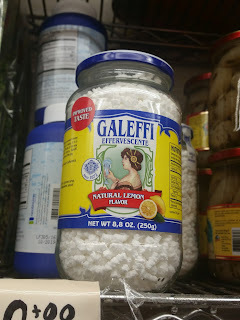 I spotted the curiosity pictured below on one of the shelves and learned later that it's a lemon-flavored antacid that hails from Italy and is often taken after meals as a digestive. Galeffi is touted as "thirst-quenching" and "refreshing." The blurb on the bottle gave me a chuckle. It promises a taste that is superior to prior versions. Later research revealed that it is used as a substitute for Brioschi, which has gone out of business. But enough about indigestion...let's talk ravioli! Another Bronx institution located not far from Calandra's is Borgatti's Ravioli & Egg Noodles, founded in 1935. The third-generation, family run, specialty pasta shop has been recognized by the Food Network and Epicurious Magazine and was awarded a 29 out of 30 for quality by Zagat's Marketplace survey. All I know is that the overstuffed cheesy pillows were among the best ravioli I've ever tasted. Borgatti's, founded in 1935, was where I purchased some of the best ravioli I ever tasted. Purchases made during my trip. Also worthy of mention is Teitel Brothers. The third-generation, family run business traces its humble beginnings to Jacob and Morris Teitel, a pair of Austrian Jewish immigrants who made their way to America by way of Ellis Island. It's been reported that Jacob speak Italian before he mastered English because his neighbors were predominantly Italian. 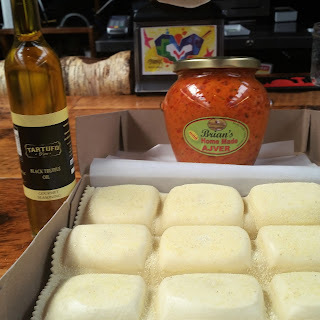 For more than a century, the family has been doing business on Arthur Avenue and customers continue to flock there for Italian gourmet specialty items like imported olive oil, canned tomatoes, aged vinegar and fresh sausage, to name but a few. A must-stop for pastry lovers is Egidio Pastry which dates back to 1912 and is known as the oldest pastry shop in the Bronx. The shop remained in the family until the 1990's when the last daughter (who was in her 90's at the time) sold it to a woman of Italian descent by the name of Carmella Lucciola. "Carmella still uses all the original recipes written by hand on onion skin paper stored in a box in the kitchen. Bakers continue to refer to those recipes," said Oteri. And no trip to the area is complete without a stop at the Arthur Avenue Retail Market where you'll find Mike's Deli, which earned national attention when Bobby Flay challenged proprietor David Greco to an eggplant Parmesan throw down. To find out who won, you can visit the webpage here. During my visit, I even witnessed a few fireworks while strolling between the stalls. An older woman and a younger female (whom I assumed were family) were engaged in a heated exchange. The younger one stormed off the job while the men just smiled and shook their heads; they knew better then to get involved. Don't ask me how I know. Ahh, nostalgia. Scenes from Arthur Avenue Retail Market, taken from my perch at the Bronx Beer Hall. The retail market carries nearly everything you'll need for a splendid repast, from meats, to cheeses, to pasta, fish and more. The Bronx Beer Hall is a relative newcomer that opened in 2013. Located in the heart of the action, it specializes in beer from local breweries and provides the shopper with a chance to take a break, grab a bite and enjoy an adult libation. I unloaded my packages on the bar and savored a glass of Cabernet before heading back out to explore. Arthur Avenue is no place for those watching their "carb" intake, so save up those calories and consider ditching the diet before visiting. I never experienced the food at the restaurants on Arthur Avenue since my time in the area was limited. Nonetheless, I did manage to snack along the way, tasting a little here and a little there. Having heard much about Michelin-recommended Tra Di Noi (meaning 'between us'), I made it a point to poke my head inside to snap a picture of the old-school, red-checked tablecloth, Italian mainstay. Tra Di Noi is listed on TripAdvisor as the #1 restaurant in the Bronx. The intimate trattoria ranks number one on TripAdvisor with its classical Italian cuisine . Chef Marco Coletta, who once cooked for Italian nobility, brings over 50 years of cooking experience to the table. It's definitely on my list of places to try when I return in May. During my exploration, I stumbled on the Bronx Library Center, where I bought a few books and browsed amidst the stacks. I was pleasantly surprised to discover a thriving library in a busy shopping area. 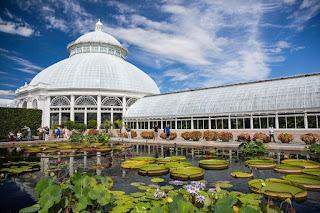 Other Bronx destinations worthy of mention include the Bronx Zoo and the New York Botanical Gardens both located in Bronx Park. 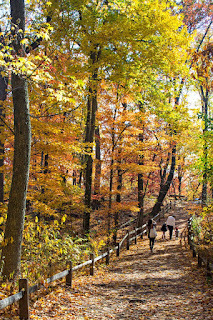 The Bronx Zoo, is known for being the largest metropolitan zoo in the United States and is among the largest in the world averaging approximately 2.15 million visitors each year. 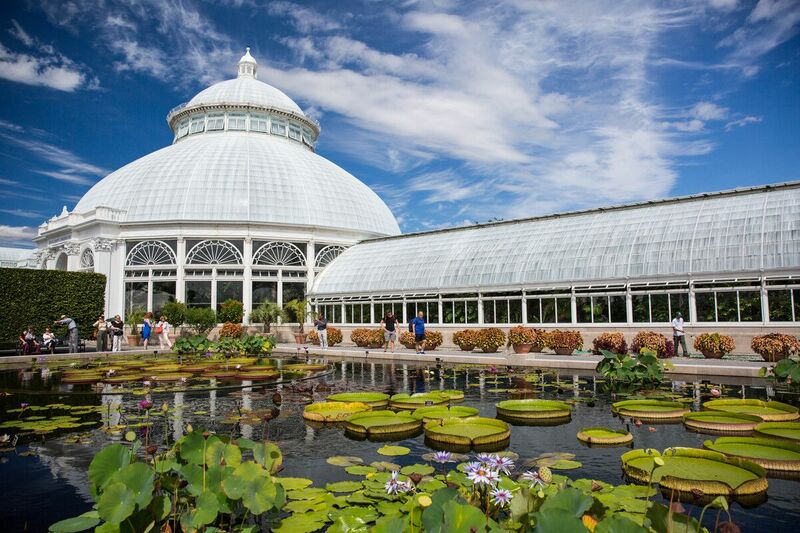 The nearby botanical gardens are recognized as a National Historic Landmark. Dating back to 1891 the destination spans 250 acres and attracts nearly one million visitors per year. Events and exhibitions are listed on their website. These are but a few of the age-old institutions that make Arthur Avenue what it is today. Have you visited? I'd be interested in knowing about your favorites before I return.